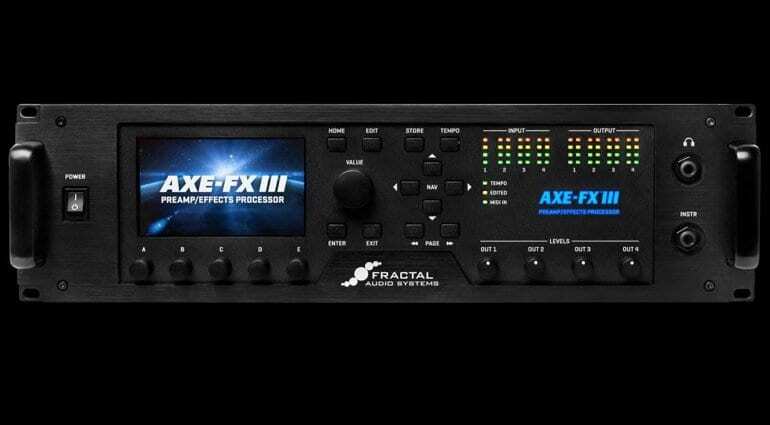 The latest incarnation of Fractal Audio System’s AxeFX has been announced at NAMM with the arrival of AxeFX III with even more than before if that is even possible? Not one, but two 1.0 GHz, floating-point Keystone Digital Signal Processors (DSPs) comprise the main audio engine and it has 4Gb of fast PC1600 DDR3 RAM and with all this power comes better signal processing and even more amps, effects and cabinet simulations than previous iterations, in fact, they even made a graph to show us exactly how much more. Okay, the ridiculous Powerpoint-style graph means nothing to me, but I think it is funny they need to visually show us the power. The new unit also has a nicer large 800×480 colour display on the front that has 30 times the resolution of the older version and it also has five rotary push encoders you can assign to twiddle with parameters, plus the main data encoder as well. 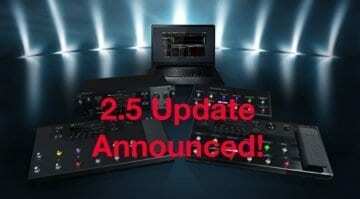 The new AxeFX III has an extra six analogue inputs are available including a pair of balanced XLR/1/4″ combo-jacks plus two pairs of balanced 1/4″ jack inputs. 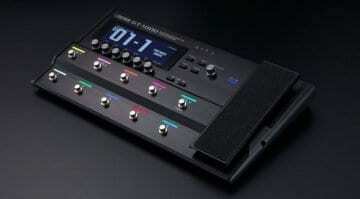 Then you get MIDI In/Out/Thru, FASLINK II, USB, SP/DIF and two expression pedal inputs. 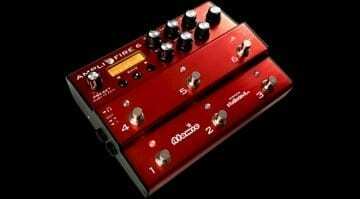 More effects, more cabs and way more amps! 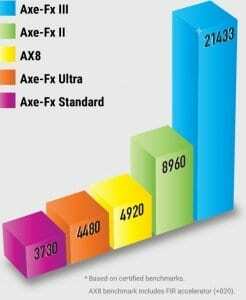 This new version of the AxeFX has over 2200 virtual cabinet models included and a further 2,048 slots for your own custom Impulse Responses (IRs), so you could be able to find something you like within that lot. 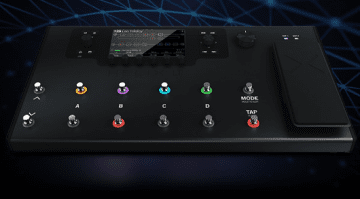 With all the extra processing power you can also have up to six effects running in parallel and still create four separate and add another independent effects chains at the same time, so you could probably get lost in effects if you so desired with that amount at your disposal. With all this power you can add more depth to amp models, though we have no real details, just yet on this aspect and so I suggest keep checking back on their website below for more details. There is no price just yet and they have yet to announce the release date, so keep checking back and we will update you as soon as we know. The main announcement came via their Facebook page earlier today and so expect more announcements over the coming weeks. You can sign up on the wait list to get one from the link below, as I think the demand for these will be really high and you may need to get in fairly quickly to get one.